Fanged Fics has a new look. Southernlady23 has been working hard giving the site a new look. Please stop by today and take a look. Fanged Fics has added a new author of the month feature that interviews your favorite fanged fic writing authors. 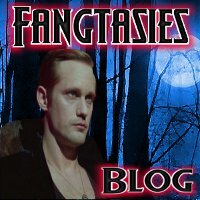 Please follow the Fanged Fics twitter at http://twitter.com/@fangedfics and help promote the blog by posting their new button. FangReader's is a site which unites readers and authors. They host a chat room with daily topics to discuss or to talk to other readers. Authors are welcomed to stop in the chat room and promote their stories to the fangreaders. Their site offers author chat nights where you can meet the authors of your favorite fics and discuss their stories. 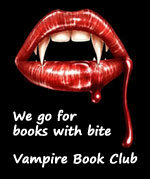 Check out their calendar to see which author's are signed up to host a night in the chat room. Chat times are Sunday starting at 8pm GMT; Monday through Saturday starting at 9 pm GMT. You can suggest a story for the fangreaders to read by submitting the information on their form. Fangreaders is now hosting the lemon tarts awards. Please stop by and drop off nominations for your favorite lemon fics and lemon scenes. 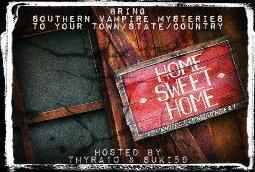 Write a totally Original story using the Southern Vampire Mysteries/TrueBlood characters; any pairing, any rating as long as the vamps are vamps, the human are human and the supes are supes. First off I wanted to let everyone know that Fangtasies has a new web address. It has been changed from http://viking-fangtasies.blogspot.com to the newest url http://fangtasies.blogspot.com. If anyone tries to access this site from the previous url you will see a message stating that it has been deleted. Please update your bookmarks to avoid missing out on the latest True Blood/Fan fiction news. Secondly there has been some negativity in the fan fiction community lately and to help spread the peace I have made a button. Please grab and post the button on your sites (located to the right) to help show your support for peace in the Fandom. Life is too short to worry about pettiness, cliques, and cattiness. Fan fiction is about having fun, making friends, and entertaining our readers. Let's not allow misunderstandings to bring our Fandom down. Help promote Fangtasies. Please grab our new button on the right menu to help promote this site. Tis the season for contests it seems. There are currently three new contests running at this time. Below you can read about the contest rules, guidelines, where to send your entries, and the contest hosts. Please visit their sites, spread the word, and follow them on twitter. What if Eric lived in your hometown? Or Sookie visited the place where you grew up? Or maybe Jason was dating the girl next door to where you live now? Or Bill seduced the cashier at your local supermarket because she could get him free coupons? Or Amelia turned your hairdresser into a parrot? Or the guy two doors down from you had a dog named Alcide? Or Pam was your local soccer mum? Or, or…. Write us a story about any or all of the SVM characters and put them in a place in which you’ve lived. It can be a country, state, province, city, town, village, or even neighborhood that you’ve called home. What happens there is entirely up to you! Your hosts are Thyra10 and Suki59 and both of us have sent Sookie and Eric to our own hometowns quite a few times. Now, we’d like to see where you live or used to live. Please, invite us in – take us to your Home Sweet Home. Visit The Home Sweet Home's website HERE for more information. Happy endings. We all love ‘em, but they’ve been done. To death. They’ve become predictable, and sometimes a little cliched. As much as we’d like it to happen, happy endings aren’t always possible. Besides, we all know the only real happy endings happen in fairy tales anyway. So, in the spirit of shaking things up and keeping it real, we proudly present the Happily (N)ever After Contest. This contest is open to all pairings, and pretty much any style of story you want to write. All human, Alternate Universe, Canon…whatever floats your boat, so long as your pairing/main character doesn’t get the much sought after HEA. Maybe you have an inner angsty side and you want to let her out. Maybe you have never tried writing unhappy things, and you want to stretch your writing muscles a bit. This is about changing it up, going against the grain, trying something different, and it could be a lot of fun to discover what you’re capable of. Fairy tales usually have happy endings. We all know what has happened in stories like Cinderella, Sleeping Beauty, and Snow White. It is usually a lot of romance where the princes come to the rescue. What happens when the prince is a Viking vampire or Cinderella is actually a telepath? How far can Sookie fall down the rabbit hole before Mad Hatter Eric catches her? What if Sookie fell asleep for 1000 years because of a curse and it took a young Eric to kiss her and break the spell? Play with your imagination. Be funny or serious. 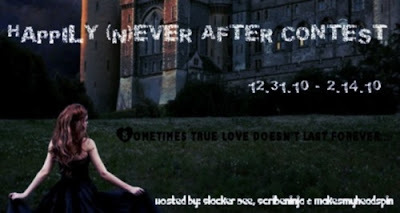 Make it a mystery or an epic fairy tale romance. Whatever you are into, write your own version of a SVM fairy tale. Happily Ever Afters and Lemons not required but appreciated! Submissions are accepted beginning: Monday, December 6, 2010 – Friday, January 21, 2011. Final submission: Friday, January 21, 10 pm PST, 12pm CST. Final Judging deadline: January 31. If links are not received by that time the story will not be included in Public Judging. Public voting of the Judges top 6: Wednesday, February 2, – Monday, February 7. ShadoKat, charhamblin, TheLadyKT, NelBearPig, Mrs.Northman, and donael!